« I am the light of the world. When we light candles intended for prayer, we remember Jesus, the Christ, who was sent into the world to be its Light. Blessed Basil Moreau spent his life in the service of Christ and in the mission of spreading the light of truth that is the Gospel. Lighting a candle is a way of extending one’s prayer or of showing solidarity with a person on whose behalf a prayer is offered. Prayers invoking a saint’s intercession are also common because of the saints’ friendship with God in heaven. Saints are powerful intercessors. The lighting of candles at their tombs has been observed since the time of the early Christians. 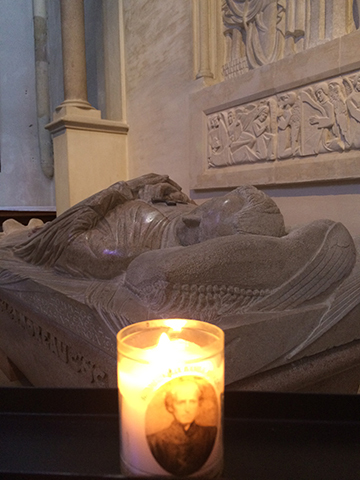 The Shrine of Blessed Basil Moreau offers you the opportunity to light a candle at the tomb of the founder of the religious family of Holy Cross, accompanied by your prayer intention. By way of your offering, the Shrine staff will place and light your candle beside his tomb, along with other candles similarly requested. The Shrine will make every effort to honor your request within 24 hours. 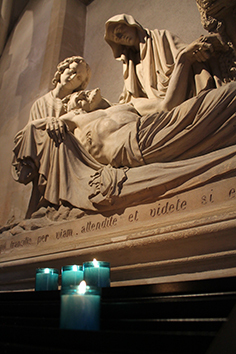 To light a candle before the tomb of Blessed Basil Moreau, please complete the information below. Required fields are indicated by a star (*). illuminate the way before me in the midst of my difficulties and decisions. May it burn away in me all selfishness and pride. May it be a flame by which you warm my heart and teach me to love. Blessed Basil Moreau, I have confidence in your intercession. and with whom you now dwell in heaven. 12345678910 One-day vigil candle(s) at the Shrine of Blessed Basil Moreau.